Hershey's Kisses come in six different flavors, some with fillings. A single Kiss is a treat that won't add too much to your daily calorie intake. According to Hershey's, nine Kisses are a single serving. A serving of milk chocolate Kisses contains 200 calories, so a single Kiss is just over 22 calories. Hugs, made of chocolate and white chocolate, hold a little over 23 calories each, as do Kisses with almonds. 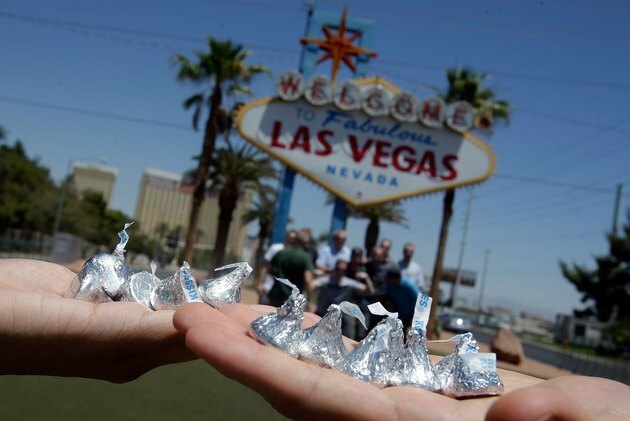 Around half of the calories in these Kisses come from fat. Special dark and cherry cordial Kisses are 20 calories each. Special dark Kisses are higher in fat content than cherry cordial Kisses. Kisses filled with caramel come in at just over 21 calories per piece. Milk chocolate varieties of Kisses provide 8 percent of the recommended daily total for calcium per serving. A serving of Hugs contains 10 percent of your daily calcium. Special dark Kisses offer 10 percent of your daily iron needs. Dark chocolate also contains beneficial antioxidants.